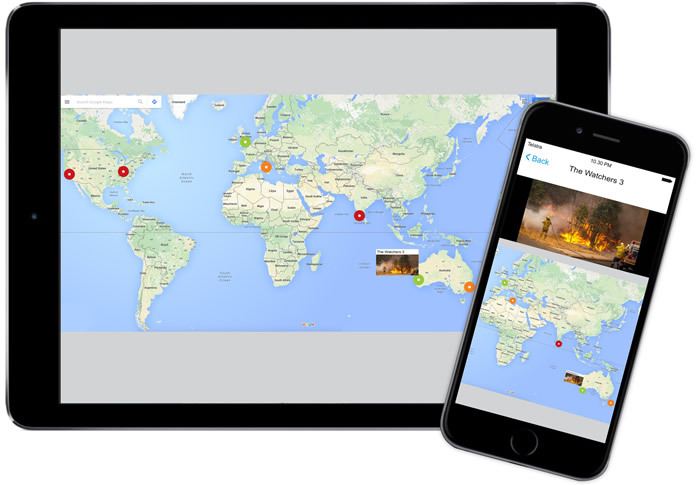 If you have a smartphone you can live stream video and show your location on a web based map from anywhere in the world. Use the fully zoomable map to see where you are and what you are streaming. Become a Watcher (no cost for you) and you can live stream video directly from your cell phone. At the same time your geographic location is tracked live on an interactive zoomable map. Open the website on your computer or open the app and you can live track any Watcher from your computer, iPhone or Android device whilst they are live streaming an event. Get the free iPhone app here or get the Android app here. Emergency services and first responders can live stream video of any incident or accident back to their control center in complete privacy using a private network which we can activate or which your company an control. No special equipment needed, just your cellphone or computer and the TracknWatch app. Visit the general map to see what everyone is talking about. With TracknWatch storm chasers can live stream hurricanes, tornados, storms and severe weather events to warn the general public. Not only will people see the event live, but they can also track the storm chaser on a zoomable map for the latest status. This can be useful for both the general population and for authorities. Are you near a news event? A critical situation? Do you want to live stream video that event to the world? If you're a Watcher (no cost for you) TracknWatch allows anyone anywhere to live stream news events across the world and you may even get paid for it. Security companies worldwide are live streaming whilst tracking the locations of their security officers at the scene, providing clients with a service that is second to none. Just think about the enormous potential of such an incredible security tool. Call us to find out more by emailing support@tracknwatch.com for more information.